Visit Good Shepherd Lutheran Church’s YouTube page to view a video recording of this sermon. I first looked at the scripture readings for this weekend about a month ago. And I have to honest, I was disappointed that these were going to be the scripture readings for our last worship together before I leave on sabbatical. You and I actually hear scripture readings with shepherd imagery every year on the fourth Sunday of Easter. And, if you attend a funeral once in a while, you probably hear some of these readings far more frequently. But, just because we hear texts about the Good Shepherd many times a year, doesn’t necessarily mean that we actually hear them? No answers. Silence. Blank stares. My initial disappointment with today’s scripture readings stems from that story’s point – I know the answer should be Jesus, but it sounds a lot like something else. I mean, I’ve never herded sheep. I’m guessing that is true for most of us. And in fact, I’ve never actually met a shepherd. I’m guessing that is also true for many of you too. And, I’ve never fought with a wolf before. My only contact with a wolf is watching them through some sort of protective barrier at a zoo. Again, I’m guessing that is the case for most of us. The challenge that the shepherd texts present for us today is that many of us don’t have any direct relationship with shepherds or sheep. And since the early days of the Christian church, this lack of relationship forces us to interpret these texts in a way that turns our pastors into the shepherd. To take this interpretation further pastors are shepherds of their flocks and therefore, in some important way, are “like” Jesus, or at the very least striving to be like Jesus. Pastor Kathryn Matthews offers that, “Perhaps, when we focus on pastors, as shepherds, we fail to think of ourselves as the sheep, or to think about the Good Shepherd himself.” I like her thoughts and what to add that if our focus is only on pastors as shepherds, we fail to remember that pastors are sheep of the Good Shepherd too. Just like everyone else. I am – even as I live out my call as one of your pastors and try to uphold the vows of ordination that I made before God and the church – I am, a sheep of the same flock that each one of you are part of. That doesn’t mean that I don’t serve as a shepherd of the congregation where I am called to be a pastor. That doesn’t mean that I don’t serve as a shepherd for my friends or family at times. All of us can think of times when we are called to serve as a shepherd in our relationships in the communities in which we live. But even in times when we are called to be a shepherd, we are never the Good Shepherd. You and I are always sheep. And we will always be sheep. Jesus is the shepherd. And will always be the Good Shepherd. Barth’s idea of no such thing as an individual Christian couldn’t ring more true in the scripture readings about the Good Shepherd. Note that there is no separate singular form of the word sheep. What do you call one? Sheep. What do call many? Sheep. Maybe that’s why there is so much of the Bible devoted to sheep and shepherds – to help us understand just how much you and I belong together and that, because of the Good Shepherd, we are never alone. 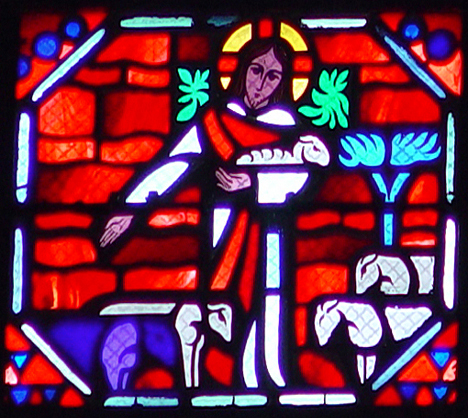 So, as part of the Good Shepherd’s flock living out our faith through this part of the flock known as Good Shepherd Lutheran Church, what do sheep look like as the Good Shepherd leads them? Maybe it’s the sheep of this congregation, part of the Good Shepherd’s flock, overwhelmingly supporting our youth through financial gifts and prayer as they get ready to embark on summer mission trips that will take them from Detroit, Michigan to Gethsemane, El Salvador. Or maybe it’s the sheep of this congregation, part of the Good Shepherd’s flock, who are eating M&Ms this month and returning the empty containers filled with money in order to bless our brothers and sisters in Christ who live in the Central African Republic. Even though these brothers and sisters live half of a world away, they are sheep of the same flock. Or maybe it’s the sheep of this congregation, part of the Good Shepherd’s flock, who will donate glue sticks and peanut butter and toilet paper to bless hundreds of children attending summer bible camp at Camp of the Cross. Summer camp children who are sheep of the same flock. Or maybe it’s the sheep of this congregation, part of the Good Shepherd’s flock, who are stepping WAY outside of their comfort zone this weekend and making May Day baskets that they will give away on May 1st. A simple basket that will remind someone that they are part of the Good Shepherd’s flock and loved unconditionally. You know what…I think I need to let go of the disappointment I had a few weeks ago regarding the scripture readings for today. How can anyone be disappointed when these texts help you and I to remember that we belong to God and are part of the Good Shepherd’s flock forever? Brothers and sisters in Christ, later this week I begin a three month sabbatical. I’ll be back with you in August. I’m thankful for this time of sabbatical and pray that it is a blessing not only to me and my family, but also to every sheep who calls Good Shepherd Lutheran Church their faith home. You can read more about what I’ll be doing on sabbatical in the May newsletter. And as I enter this time of sabbatical, I want you to know how grateful I am to be a sheep with you in the Good Shepherd’s flock. And, finally, I want to tell you one more time just how much you are loved. Not only by me as one of your pastors, but most importantly by God, the father of the Good Shepherd – our risen Lord and Savior Jesus the Christ. Amen. This entry was posted on Wednesday, April 29th, 2015 at 3:23 pm	and posted in Recent Sermons. You can follow any responses to this entry through the RSS 2.0 feed.